I didn’t think that was possible in the military. After all, it’s hierarchical. You have to pay your dues. Right? When I was growing up in the DC area, the local fathers in the military looked the part. They were disciplined. Self confident. And they had grey hair. Several years ago I spent four days with retired Lieutenant General Paul Cerjan in a leadership training class. The first day he gave me an assessment of my strengths and weaknesses. People who have known me for fifty years couldn’t have been more accurate. Paul had a commanding presence. He was a good communicator. Not a bad psychologist. And I knew if he gave me an order, I wouldn’t have hesitated for a second. A month ago, I heard Vern Clark, former Commander of the Navy, speak at a Lifework Leadership class. He was articulate. Direct. Engaging. If they were recruiting 50-somethings to enlist in the Navy that night, I’d have been first in line. And then there’s Second Lieutenant Juan Pinzon. Although he’s been commissioned, he doesn’t actually report to the Marines for six more months. And he’s twenty-two years old. But after a ninety-minute conversation at Panera Bread, I’d follow him into battle in a heartbeat. I made reference to Juan in my blog post about Alex Sink entitled “The Stories Behind Sound Bite Nation.” Juan recently graduated from Wake Forest University with a degree in Psychology. When I met him three months ago, he was looking for local employment before he reports to Quantico to begin his career in the Marines in April 2013. I contacted master networker John Gullman with PNC Bank, who put Juan in touch with a customer of John’s who has had great success hiring former military personnel. John was a Marine in the Vietnam War, and he continues to take the motto Semper Fi to heart. Juan’s parents brought him and his two brothers to the United States from Colombia when Juan was nine years old. His parents had been successful professionals in Colombia, but believed that the best future for the three boys lay in the United States. They left behind their extended families and came to this country without jobs, contacts, or command of the English language. Mrs. Pinzon began working for Broward County and Mr. Pinzon started a business in their home selling apparel over the internet. It was a difficult adjustment. When it got toughest, the lessons were clear: you looked out for one another; and you worked even harder. Juan is committed to self-improvement. When we met at 8:00 a.m. at Panera Bread, I admitted that I’d been up for two hours and had already eaten breakfast. He sheepishly admitted that he, too, had already eaten – after his 5:30 a.m. workout in the gym. He is an avid reader and we discussed The Road Less Traveled and Five Dysfunctions of a Team. Throughout our conversation, Juan described things that he had learned at school, or from his parents, or on the job – and then how he applied that knowledge. As close as he is to his family, Juan struck me as being very self-reliant. I saw on his resume that he was fluent in French. I asked if that was the product of a Wake Forest semester abroad. Juan hesitated. “Kind of…,” he replied. He proceeded to explain that he signed up for a Wake Forest Summer Abroad program in France only to find out that his scholarship did not cover the costs. Juan would have been the eighth student to participate, the minimum required. Without him, Wake Forest canceled the program. However, Juan was determined to go, so he contacted the French University (The Institute de Touraine, in Tours, France) and identified the tuition and travel costs, made arrangements to stay with a local French family and then went out and raised the money himself. So Juan did the five week Summer Abroad program … on his own. Juan said that he’s wanted to be a Marine since he was in Middle School. He said he needed the discipline. I almost spit my coffee out on the table when he said it. He might as well have the word “discipline” tattoed on his forehead. Here was a kid who graduated from Wake Forest, whose academic standards and demanding curriculum have earned it the nickname “Work Forest.” You don’t survive there without discipline. 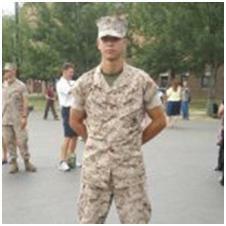 Juan entered the Officer’s Candidate School at Quantico with more then three hundred individuals. They were subjected to a grueling training program that led to non-stop cotton-mouth, bouts of shin splints, sleep deprivation, and moments of doubt for everyone. One-third of the candidates washed out and did not graduate from the program. I was in a great mood when I left Panera Bread. Over a cup of coffee I gained a new friend, and one that I hope to have for the long haul. My ninety-minute meeting with Juan gave me a sense of tremendous optimism about our military and about our youth. 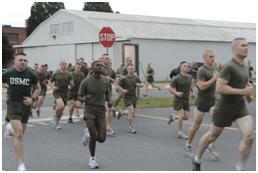 If Juan is any indication, perhaps the military is attracting our best and our brightest. I can’t speak for the other officers entering the Marine Corps in April 2013, but when it comes to Second Lieutenant Juan Pinzon, they picked the right man for the job. To paraphrase Colonel Jessup from “A Few Good Men,” we want him on that wall! Like too many Americans, I take our military for granted. Don’t get me wrong, when I stop and reflect, I recognize the huge debt of gratitude we owe them for our freedoms. But how often do I stop and think about it? When I see a thirty-second video clip about violence on the ground in the Middle East on CNN. And then they shift to a story about sports or politics, and my brain goes somewhere else. When I see a picture of flag-draped coffins in a picture on Facebook, the image stays a little longer. But then I see a video of singing babies or cute puppies, and I move on. And then there are days like last Monday, when the military gets recognized on television and in the newspapers. Speeches were made and flags were flying. It was Veterans Day. And then the following day, most of us went back to our regular routines with our normal concerns. And the men and women of the military did what they always do. They soldiered on. I came of age after the draft ended, and yet close friends of mine chose to enter the various branches of the military. With a bad back and no depth perception, I probably wouldn’t have been accepted, but I never even considered a military career. Yet, as I watched Scott Campbell on CNN on the ground in Desert Storm, and looked at the picture of Brooks Lyles in Mogadishu, it all became real – or at least personal, from thousands of miles away. My deepest thanks for career choices different than my own, that the rest of us might live in the land of the free and the home of the brave. Thank you. Hi Karl, I’m a little late in responding here but once again I have had the honor of meeting another inspirational person and hearing his story through your powerful words. Your reflections on patriotism, leadership and gratitude to the military touch a lot of chords. It’s interesting that I not only learn about another person but I also learn a lot about you- your compassion, listening abilities, humility, reflections- through your stories. The story behind the story is as interesting and thought-provoking as the story itself. Thank you for sharing. You turn an ordinary encounter into artwork. Really! Kathy, you’re too kind. Sometimes I feel like a kid trying to draw a picture of a scene and I’ve got a box of stubby crayons and no sharpener. It’s colorful, but I don’t know if it conveys the real picture. But then, that is you, seeing the picture, sensing the texture and color, and then capturing the essence of the story with your own words. You’re the best. every webmaster (for content creation and SEO).